Hello. Welcome Back. Nice to see you. I do apologize for the week long absence that you have all had to deal with. Last week was a flurry. We moved Taylor into his Dorm, celebrated my Birthday, went to a Ball Game, ETC, ETC, ETC. Busy, busy, busy. Lucky for you, I ate a lot. On the day of my Birthday, we were in the Miami/Ft. Lauderdale Area. We decided to eat Mexican Food because, Mexican Food is awesome. Typically I would right about a location all in one post but, this place was so great, that I have decided to give each item it’s own post. Because, yeah, It Was That Good. First up, we will discuss the Chicken Tostada. Ohh Snap – I haven’t even mentioned the name of the location! We went to El Agave Azul which is located off SR 84 in Ft. Lauderdale. This is a true hole-in-the-wall with a simple sign of ‘Tacos’ outside of the location. We arrived for a late lunch/early dinner and ventured inside. The wait staff was great and we placed our order…and kept placing it…and placing it. It never ended. 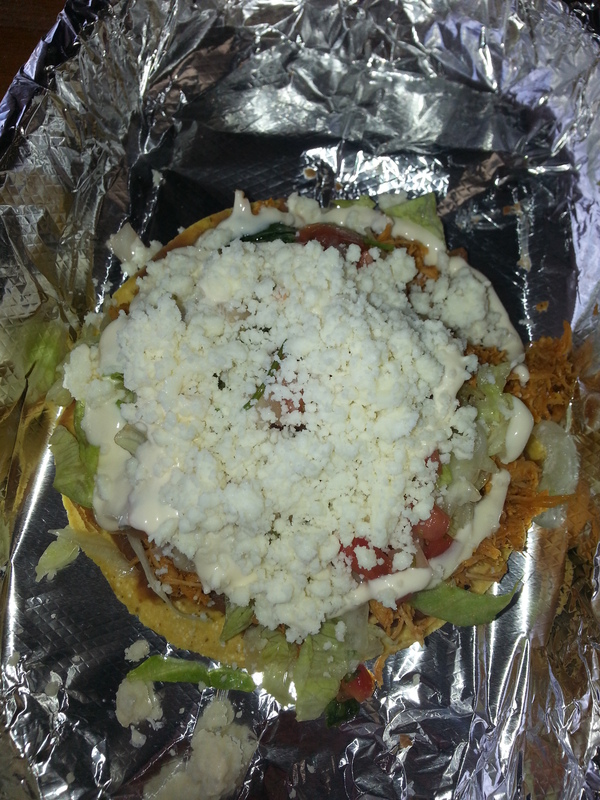 The Chicken Tostada includes Shredded Chicken, Refried Beans, PIco, Lettuce, Crema and Queso Blanco. All loaded on a crunchy tostada. This thing looked divine and I dug right in. The toppings were piled on high but I had no problem getting a bit of everything in my bite. And man, it was awesome. The shredded chicken was moist & flavorful. While the beans did not play a big role, they did add texture to the overall feeling. I loved how crisp & juicy the pico was along with the lettuce…both were just so fresh that it really made all the difference. As for the queso blanco, it was delicious as always – chunky pieces full of the minimal flavor that is just so killer. The crema was like a thicker sour cream and just tied everything together. All of these toppings, on top of a homemade tostada, made for a delicious item. The tostada stayed crispy the entire time and all of the toppings really just played together so nicely. I would go back and order tons of these suckers in a heartbeat – simply delicious. El Agave Azul knows what they are doing and, as you will soon see, it was all good. But for tonight, just know that this Chicken Tostada – It Was That Good.